SF is not a city for the vertiginous. It is built on more than 50 hills. Steep hills. Hills that'll have you yearning for a thighmaster. The steepest street is 31.5 degrees (Filbert between Hyde and Leavenworth). But to not spend some time climbing these streets and discovering its architectural treasures built on solid angles in earthquake country, while simultaneously marvelling how locals brave parking or even bother with gym memberships, is a crime. 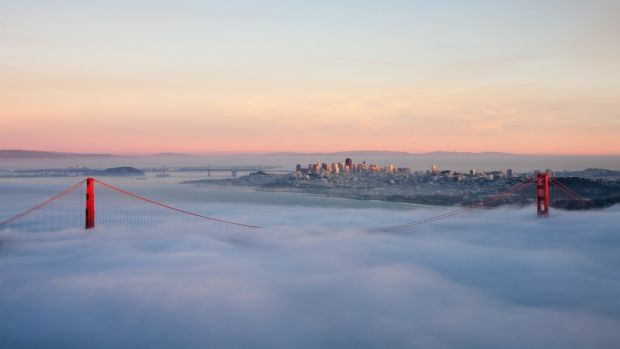 Rolling across the sky like the Neverending Story's nothing, SF's fog quietly creeps through the city's hills at night and often lingers throughout the morning, cloaking the Golden Gate Bridge atmospherically until the Californian sun burns it off. The fog is a huge part of life in the city and when the old foghorn was replaced in 1992, locals were outraged and petitioned to have it re-installed on Alcatraz Island. Every Giants' home run and winning game is greeted with a blast. SF, however, is not the foggiest city in the US – that gong goes to neighbouring Point Reyes, where the fog can linger for weeks. Despite causing havoc with shipwrecks, planes and delaying travel, it is a symbolic part of the city and a major source of inspiration for musos and artists. 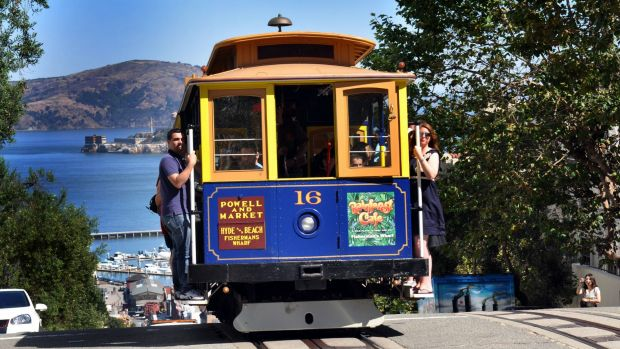 San Francisco commonly receives comparisons to Melbourne, but the most obvious parallel is its cable cars – from retro '70s-style to our green vintage trams that buzz you around the city at nine miles an hour. Visitors queue at Union Square for its most famous – the National Historic Landmark tram – that escorts you over the hills to Pier 39, saving you some serious legwork. Although SF is subjected to hundreds of earthquakes every year, most rumble by unnoticed as they measure below 3.0 on the Richter scale. The last "big one" in 1906 started a fire that left the city in ruins. 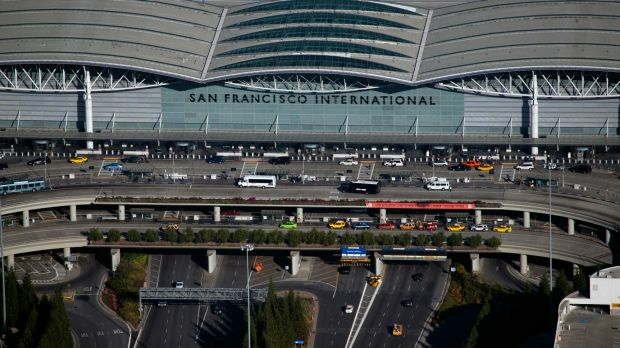 These days buildings are earthquake-proof, including the remarkable international airport that is supported by 267 columns built on ball bearings, which will allow the earth to move 20 metres in each direction. 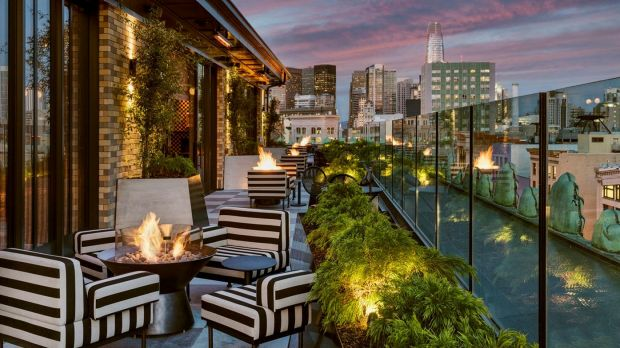 Rooftop bar at The Proper Hotel, San Francisco. 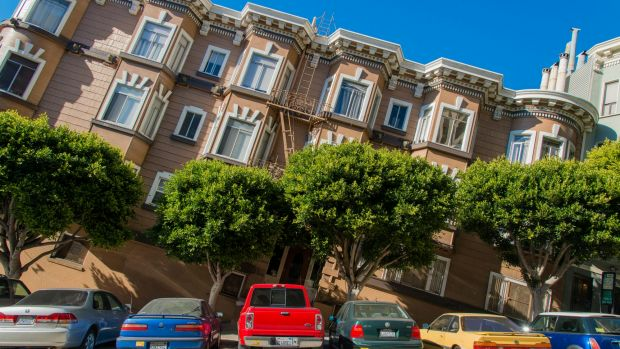 SF is actually on the base of two fault lines – the infamous San Andreas and the Hayward faultlines – and it's attributed as the reason why its locals are more edgy and risk-taking, making it a literal hotbed of invention. 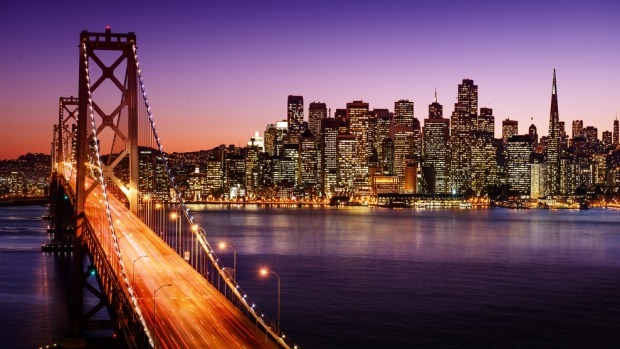 It's no secret that the tech boom has turned the city into the most expensive place to live in America – if not the universe – with average rents exceeding $US3900 (that's $5400 – ouch). Everyone in SF has a dog, and they are welcome inside everywhere, from shops to restaurants. It's a fact that dogs outnumber children and there are more dog grooming shops than schools. SF has the lowest percentage of children in any of America's largest cities. Housing costs, a huge gay population, and the tech boom helps keep the population young, single and wealthy. 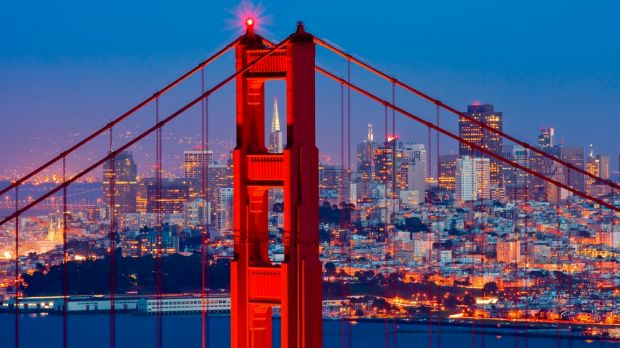 The Golden Gate Bridge wasn't meant to be red. The colour of the bridge is actually called ''international orange'', the colour of a primer used to protect the steel for the bridge during transit. The architect of the bridge loved the colour, and so it remains today. We're glad the US Navy didn't get its way, otherwise it would be a far less appealing black-and-yellow. The fortune cookie was invented in SF by a Japanese man named Makoto Hagiwara, who served them in his Japanese tea garden during the 1890s. He also created the Japanese Tea Garden in Golden Gate Park. The park is the city's huge green refuge, which provided shelter for those who lost their homes in the 1906 earthquake, giving people somewhere to pitch their tents. Across the 10,000 acres, among the strangest thing you'll see is a herd of bison – about 500 have lived in the park. 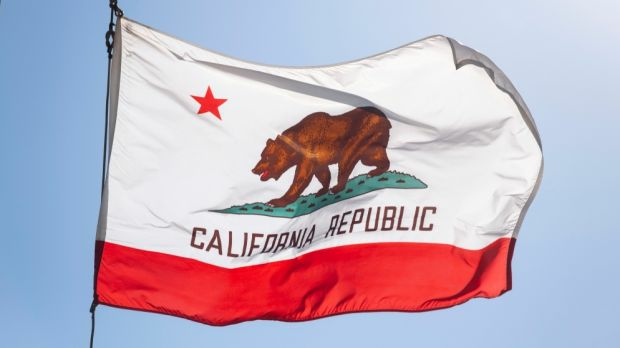 The bear on California's state flag is modelled after a California grizzly named Monarch, who was held at Golden Gate Park. He was thought to be the last wild grizzly in California. After 22 years in captivity he died in 1911, and his taxidermied pelt can be viewed at the Academy of Sciences at Golden Gate Park. The last grizzly in California was shot in 1922. 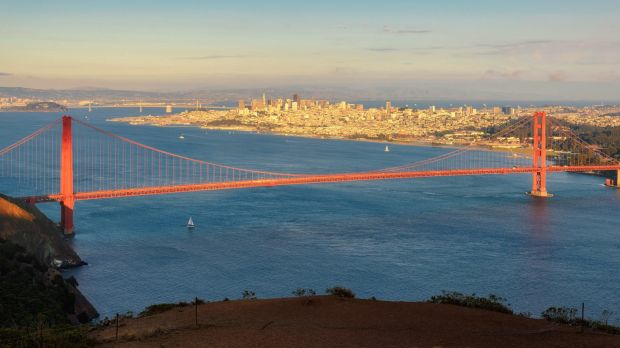 The average depth of the San Francisco Bay is only as deep as a swimming pool at approximately 3.7-4.6 metres deep. Large ships in the bay must follow deep underwater channels that are maintained by frequent dredging. 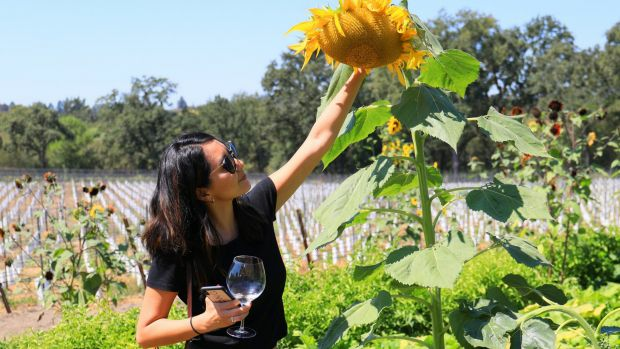 The "Summer of Love" actually started in the winter. 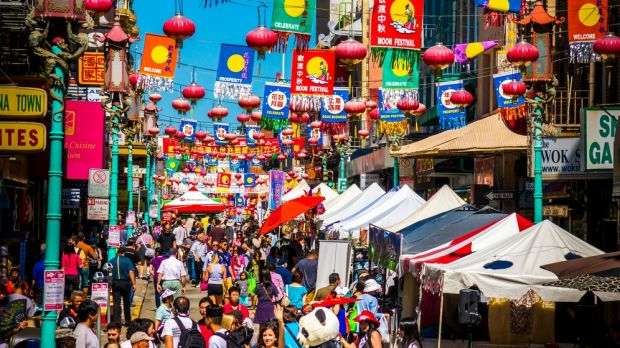 As many as 100,000 people converged at Haight-Ashbury in 1967 and although the hippies gathered in many other places in the US, Canada and Europe, SF was the most publicised location. During the Depression, not a single San Francisco-based bank failed. Business was so good, the city constructed the Oakland Bay Bridge and the Golden Gate Bridge. The hip enclave of Dogpatch fortuitously escaped disaster when the rest of SF burned in 1906. As a result, it contains some of the oldest – read expensive – houses in the city. Things weren't always rosy for this industrial outpost, named after a group of dogs that used to roam the streets for the slaughterhouses. The area was rescued by artists and creative professionals, who purchased the rundown but affordable Victorian cottages, fixed them up and transformed the area. As a result, it's one of SF's most up-and-coming areas. Nick and Nora are its mascots, a pair of cranes employed at Crane Cove Park, under construction at Pier 70. The cranes are so infamous they will remain after the park is completed. In 1902, SF outlawed all burials. Therefore, there are only two cemeteries within the city limits. The city had run out of room and graves were moved to nearby Colma, the world's only incorporated city where the dead outnumber the living. Residents include Wyatt Earp and Joe DiMaggio. As any of the local surfers will attest, and despite the number of seals, dolphins and whales you will often see in its waters, rarely do great white sharks make it into the bay from the Pacific Ocean. The first and last one was spotted in 2015. It doesn't stop people from believing they're around, however. Some of the best restaurants in the US can be found in SF and you will never run out of new restaurants to try. At any given time, there are more than 3500 restaurants open in SF – more per capita than any other city in the US. 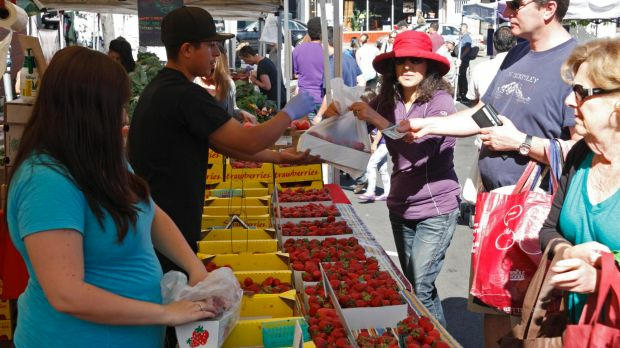 Nine farmers' markets operate in the city, including the renowned Ferry Building Farmers' Market, where local chefs find inspiration in fresh and local ingredients.